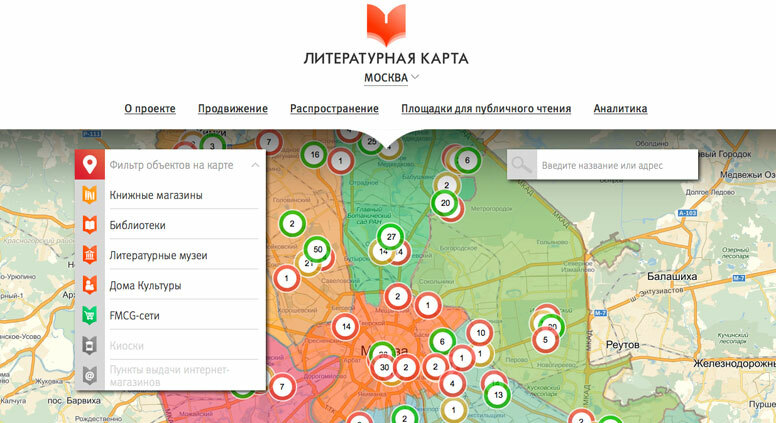 Book Industry magazine has launched a new online project called Moscow’s Literary Map. As part of 2015’s Year of Literature, Book Industry magazine has launched a new online project called Moscow’s Literary Map in collaboration with the Russian Book Union. For now the map is available online in Russian. The website targets a wide audience interested in reading, alongside specialists in the book industry. Moscow’s Literary Map includes an interactive map of book stores, literature museums, libraries and other places related to books in Moscow. “The map will let us to analyze opportunities to promote books and reading,” say the project’s creators. The project will also analyze how popular and accessible public reading spaces are, a well as understand whether readers prefer printed books or e-books. Meanwhile, the next challenge for the creators of Moscow’s Literary Map is putting together Russia’s Literary Map.